Storytelling + Research = LoiS: Tell a Fairy Tale Day is February 26th! The annual "Tell a Fairy Tale Day" is fast approaching. Of course today's post includes a story to tell. 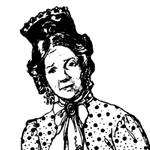 Sara Cone Bryant has had two earlier posts in the Keeping the Public in Public Domain stories. She was such an important part of the storytelling movement in the early 20th century that she deserves attention on a day dedicated to storytelling. There's a listing about her on the Online Books Page listing her works available online, including a very cursory Wikipedia article, but neither show her and maybe there's a reason for that. She looks like somebody we might rule out as too old-fashioned to be relevant. I'm going to give a story that meets a difficult topic sometimes wanted by teachers and parents: cleanliness, neatness, or tidiness -- call it what you will, it's a subject needed for preschool and primary grades. Bryant had a timeless understanding of what my Australian storytelling friends so aptly call "The Littlies." 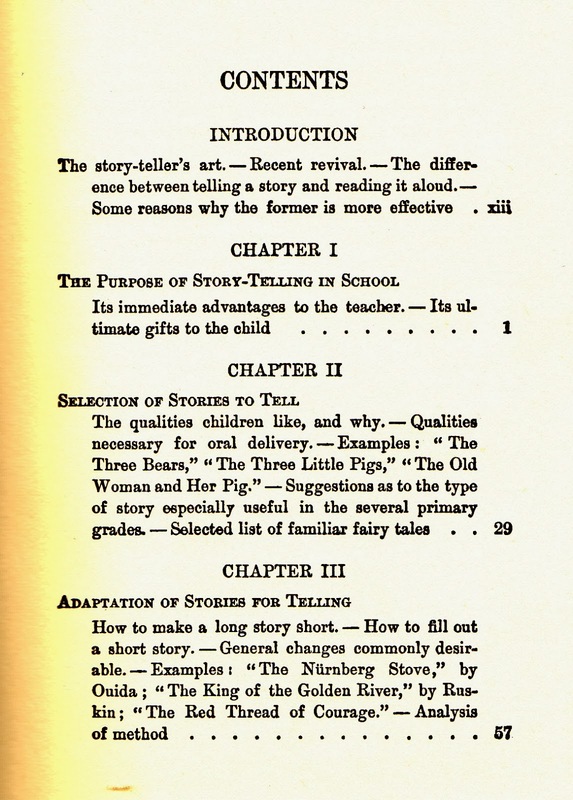 In How to Tell Stories to Children and Some Stories to Tell she has three age groups of "Stories Selected and Adapted for Telling." This is in the Kindergarten and Grade 1 section, but most preschool classes could handle it, too. Because Bryant is quick to point out that stories need adaptation, don't feel a change or two is out of line. Boys no longer wear pinafores, so just change it to clothes. 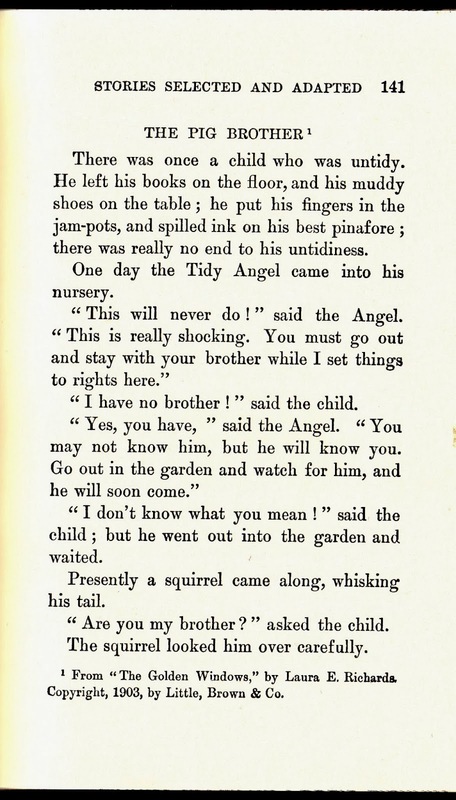 If you want this to be a fairy tale, there's no problem with the boy meeting a "Tidy Angel", but it could just as easily be the "Tidy Fairy" or . . . By all means, however, keep this light. Yet another personal side note here, I remember being shocked to hear my mother reading Cat in the Hat to my two daughters like it was a Greek Tragedy! Not only that, she wasn't fooling when she saw the mess Thing 1 and Thing 2 made! 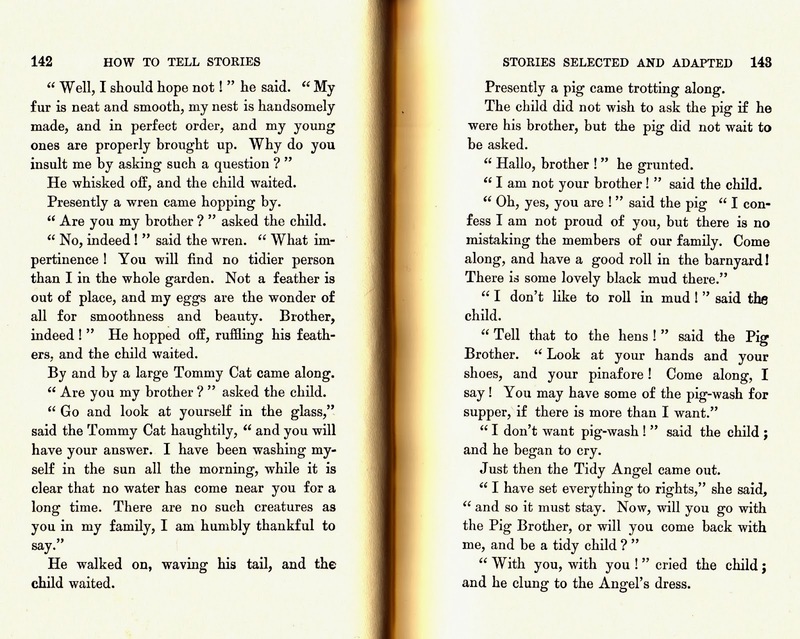 This story from Laura E. Richards' classic 1903 book, The Golden Windows, should be done with a sense of fun and even sly cheek-in-your-tongue. I hope you let the parting grumble by the pig be at least somewhat exaggerated. 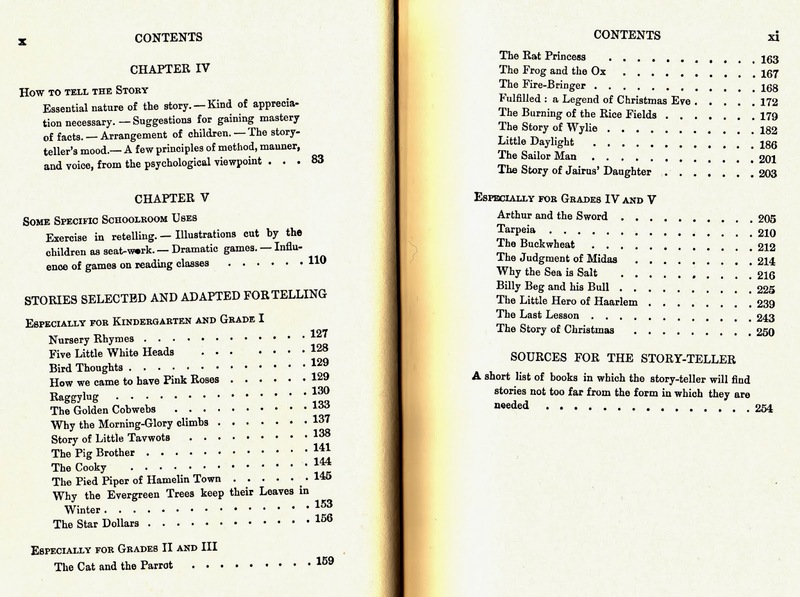 Having talked so much about Sara Cone Bryant and the book where she explains storytelling, here's a bonus, her Table of Contents to show you why you might want to download your own copy. If you look on the list of stories at Grades 2 and 3 you will see "The Burning of the Rice Fields." The 2004 Indian Ocean tsunami shows that not all stories are fairy tales and they do indeed have a value 100 years later.